[ Henry Newport, Lord Newport. ] Autograph Signature ('Hen: Newport') to Exchequer receipt, on behalf of a number of individuals including 'ffrancess Earle'. [ Receipt of His Majesty's Exchequer, London. ] 1 October 1707. 1p., 8vo.. On aged and worn paper, with damage to edges. Laid out in the customary fashion, with printed text completed in manuscript. The document records the receipt of £50 on an annuity, but the manuscript parts are hurriedly written by the witness '<?> Burton', and difficult to decipher. 2pp., 4to. In bifolium, the recto of the first leaf of which is addressed by Mary Lane to 'Doctor Robert Lane, Mobile Point, Alabama Territory'. In fair condition, on aged and worn paper. 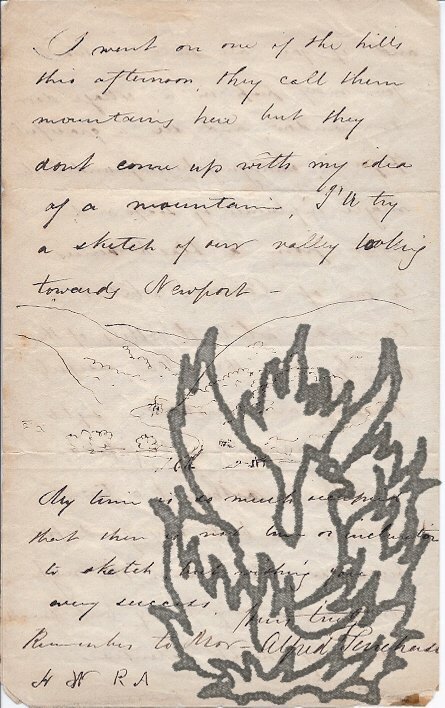 Mary Lane is semi-literate, but her letter is infused with anguish. 'Dear Brother | I have written to you Since I received your letter, but perhaps mine has never reach'd you almost every one of the family has wrote to you before this period no doubt you heard of the deaths of our father and Brother. 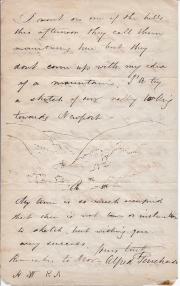 Autograph Letter Signed by Victorian artist Alfred Purchase, to 'H W R A [the Royal Academician Henry Weekes? ]', containing a description of Tredegar in Wales and its young girls, and a pencil 'sketch of our valley looking towards Newport'. 12mo, 4 pp. Bifolium. 57 lines. Text clear and complete. Fair, on aged and lightly-creased paper. Weekes is by far the most likely of the four Royal Academicians whose initials correspond to those of the recipient of this letter, the others being Henry Tamworth Wells (1828-1903); Henry Woods (1846-1921); Hubert Worthington (1886-1963). Well-written and entertaining letter, addressed to 'Dearest old Boy'. Begins with a discussions of the merits of 'Scilly as a sketching ground'. Lord Chancellor of England (1751-1838). 2 pp, 12mo. An interesting sidelight into ecclesiastical preferment. "Sir / The Living in Newport Pagnell in Buckinghamshire is that, to which I propose to present you, if you are disposed to accept it. Its Value, I am informed, but a Chancellor's Information is seldom correct, is about 280l a year - / It will require much of Residence, as the Parish is populous, & contains very numerous Inhabitants. The Duty must, therefore, be considerable - After what my excellent deceased Friend, Dr Parsons, Bp.